Exploration and non-linear gameplay are core elements that can be found in modern structures of gaming; Super Metroid arguably paved the way for the popular formula and its iconic imprint is conspicuously evident, inspiring many fantastic titles to this day. Nintendo are extremely proficient and adept at comprising an unadulterated sense of fun, with Super Metroid catering to this rule beautifully. The sense of player choice and exploration is extremely impressive, given its time, arguably giving many games of the current generation a run for their money. 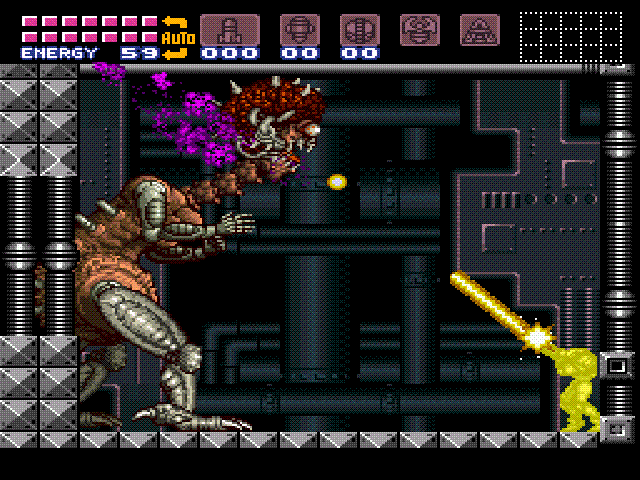 Trivial elements such as weapon unlocks, health upgrades, save points, weapon upgrades, hidden secrets, and bosses are all presented with invigoration as Super Metroid’s level of consecutive order and prevalence are determined at the player’s volition. This degree of non-linear progression is incomprehensibly riveting and provokes a rewarding sensation that few experiences can match. 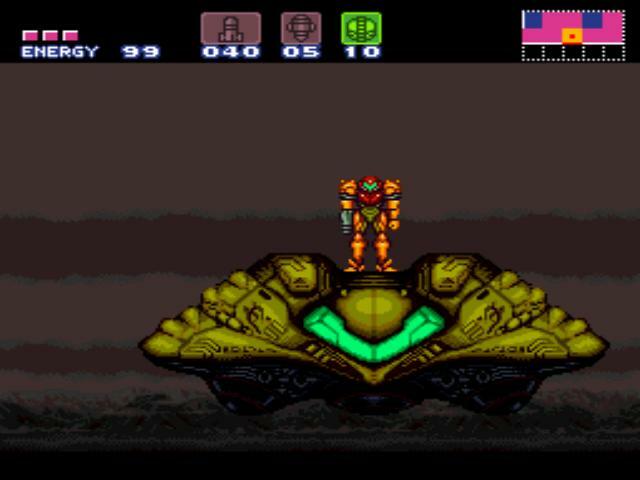 Certain areas and tantalizing items are rendered unattainable until you possess the necessary means and/or weapons to properly advance; this heavy emphasis on back-tracking is Super Metroid’s bread and butter and while travelling to old locales and fighting previously encountered enemies would prove tiresome in normal cases, Super Metroid’s responsive combat and constant allure for the unknown make the familiar journeys worthwhile. Super Metroid provides a welcomed level of challenge that’s never overbearingly difficult nor painstakingly docile. Combat and traversal require a slight level of strategy that differs from the traditional norm as certain enemies can only be defeated with certain weapons, and particular platforming segments cannot be completed without the right sets of items. Platforming in general requires a level of verticality which, up until that point, was unheard of. Hell, even a traditionally simple mechanic such as wall jumping requires a certain level of patience and skill to successfully pull off. Perhaps the most alluring aspect of Super Metroid is its inability to guide or properly inform the player. This may seem like questionable praise, but this sense of player independence is extremely rare and extraordinarily rewarding; the sense of reward derived from the experience is all dependent on the amount of exploration you partake in. As previously noted, Super Metroid is atmospherically impeccable, evoking this uncomfortable sense of fear and isolation, and when partnered with a daunting musical composition, Super Metroid truly becomes a brilliant work of Science Fiction that could easily rival the eerie atmospheric touch of the excellent Alien series. Whether the atmospheric score is ringing bombastically in your ear or lingering in the background as tension builds, it undoubtedly leaves an unsettling aura that will ultimately leave you breathless in awe, shock, and fear combined. Graphically, Super Metroid holds up extremely well and still looks fantastic in 2015. Monster designs are brightly lit, brilliantly contrasting the drab yet vivid environments of Planet Zebes. Lastly, boss fights are a noticeable highlight of Super Metroid, as if it didn’t have enough highlights already. Boss fights would always grant myself a glimpse of excitement since their imminent defeat would result in the attainment of something new; whether it be a new weapon, suit, or item, it ultimately peaked my excitement regardless. Boss fights truly showcase the beauty of Super Metroid’s combat as it requires constant movement and a strong, yet smart offensive approach, as bosses can possess menacing qualities and bombard you with vicious attacks. Sometimes the action can become so hectic that it proves difficult to make sense of the chaos that inevitably ensues. Deviation and exploration also benefits you greatly since discovering new weapons and upgrades can greatly affect your standing and give you that slight advantage to come out victorious. Super Metroid’s boss fights remain a staple of the renowned series and still proves to be challenging, engaging and extremely memorable and that last fight against Mother Brain in particular was awesome on so many levels. Every Nintendo-based Classic Corner I write up ends with nothing but high praise and my highest recommendation, which may seem a bit peculiar, but understand that I wouldn’t speak so highly of them if it weren’t warranted. Nintendo miraculously exceeds my expectations with each classic game I play and have yet to disappoint. You’ve all heard me say this before, and hopefully none of you are growing tiresome by the fact, but after sinking my teeth into Super Metroid, I can easily say that it’s one of the greatest games I’ve ever played, no questions asked. The game is just dripping with atmospheric lore that conveys an unsettling nature like no other, the dreary musical score is second to none and the game aged extremely well, the 16 bit era has never looked so good. On top of the shiny bells and whistles, Super Metroid plays like an absolute dream, easily being the best action-adventure platformer I’ve ever played. Super Metroid defined one of gaming’s best genres and arguably redefined the Metroid franchise, setting it onto its current path, before it paved the way for some of gaming’s best, including two of my recent favourite games: Bloodborne and Ori and the Blind Forest. To this day, Super Metroid’s sense of exploration is seldom rivalled and rarely has a game ever evoked this rewarding sense of quality and boast this copious amount of quantity. My first playthrough clocked in at about 8 hours with a decent percentage of items collected but once those credits began to roll, I was immediately thirsty for more. The more you put into Super Metroid, the more you get out of it; in short, this is a game that’s begging to be played over and over again, one I can see myself playing, perhaps once or twice a year for the rest of my life. It’s just that good. Having replayed Super Metroid early this year, I completely agree. I am glad you enjoyed it that much. Definitely an all-time great, and further proof that the SNES is the most timeless console of all time. Super Metroid is one of those games I’ve been meaning to play but haven’t had the chance. Did you play this on the SNES or was it a re release on the Nintendo E-Shop? Great review nonetheless, I really enjoy the concept of Classic Corner and can’t wait to see what game you play next! No problem dude! I do hope I get a chance to play it in the future as it sounds brilliant.